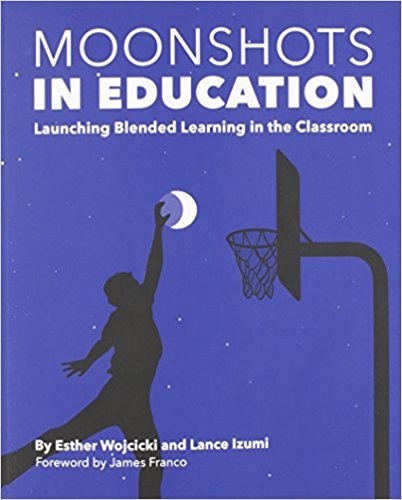 Moonshots In Education: Launching Blended Learning in the Classroom by Esther Wojcicki (Woj), Lance Izumi, et. al. explains how technology can be blended with more traditional teaching methods to allow students to have some control of their learning content, style, place, time, and pace. It shines a light on innovative schools and countries, and generally ineffective teacher training. This belongs in every school and every parent’s hands. The power of online learning is due to immediate feedback, the student owning some of the learning, and the teacher playing a less central role. Blended learning is online learning used in conjunction with classroom learning. There is some element of student control over time, place, path and pace. According to Woj, the opportunity for blended learning is now. This is a moonshot moment! The key ingredient for this kind of change is courage on the part of teachers and administrators. They need to trust students as they traditionally haven’t. Too many teachers today are scripted and teach to the tests. Parents are also overly protective of children and seldom even let them play outside unsupervised. Even when computers are used they often provide electronic worksheets, and many districts block rich learning resources like YouTube. Classroom whiteboards serve to reinforce the central position of the teacher as the “sage on the stage.” We need to teach students to search intelligently and understand the results of their searches. They must determine the credibility of the information they find and separate fact from opinion. Three things make it powerful. They are: 1) there is immediate feedback 2) the students own the learning 3) the teacher does not play the central role. Blended learning involves online learning in conjunction with classroom learning. The online part allows for some element of student control over time, place, path or pace. Woj feels that the opportunity for blended learning is now and it is a moonshot moment. School cultures need to change and it will take courage for teachers and administrators to make the necessary changes. It requires more trust in students and not scripting teacher behavior on a daily basis. Keep in mind that culture change is the hardest thing to do. 2. What is a Moonshot? Moonshots involve goals that are difficult to achieve, perhaps seemingly impossible. The main goal of this book is to help teachers “shoot for the moon.” To quote JFK, “We choose to do this not because it’s easy, but because it’s hard”. This entry was posted on Tuesday, October 17th, 2017 at 8:36 am	and is filed under Book Summaries, Education Books, Leadership Books. You can follow any responses to this entry through the RSS 2.0 feed. You can leave a response, or trackback from your own site.